Since early 70’s Fiberglass Fabrics have found an interesting application for filtration and uniform distribution of molten aluminium. Oxides are generated when molten aluminium comes in contact with oxygen in air. Chemical reactions occur at high temperatures particularly during melting, be it primary melting, foundry casting or recycling. Oxides must be removed before the metal is cast and this is the stage where fiberglass fabrics and articles made there from are used to give better casting results. The simplest form of application is directly as a cut piece of filter fabric. 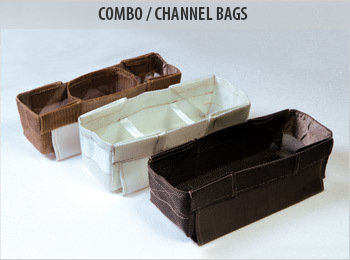 Evolved shapes stitched from glass fabrics like Combo Bags, Channel Bags, Spout Socks, Funnels, and Launder Socks are also used. These articles help to reduce turbulence, filter oxides as well as improve temperature distribution throughout the ingot. These fabrics are treated with resinous chemicals to stabilize the weave. Molten metal is filtered through this mesh. Number of yarns used will determine the strength of the fabric during filtration. This will also control the amount of flow of liquid aluminium. Smoke free fabrics are also available as a thermal treatment is imparted on the fabric. Urja is one of the largest manufacturers of glass fabrics suitable for filtration of molten aluminium and is well recognized by over 250 aluminium companies in over 15 countries. 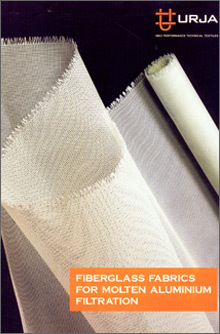 Fiberglass filter fabrics are woven in either plain or leno weaves. Plain weave is used where fine filtration is required and Leno weave fabrics are used where mesh size required is more open. A leno weave locks yarns in the fabric and this gives more dimensional stability. Customers can order fabrics in any width up to 1500mm. Cut pieces of different sizes and shapes are also available. 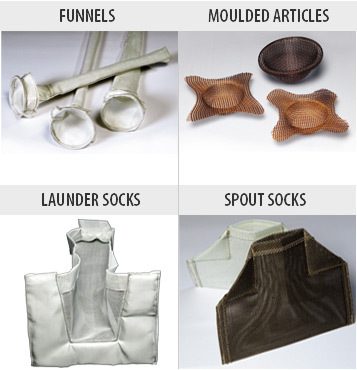 Open launders allow dissipation of heat and undesirable oxidation of free flowing aluminium. Simple logic therefore would be to cover the launder passage with INSULATING LIDS. It would be worthwhile to consult our engineers for a design that would suit any specific application. Tailor made launder insulation systems are our specialty. Urja manufactures sleeves that are specially crafted from heat resisting fabrics for protection of cables and hoses. Cables in critical areas are thus protected from molten metal splashes, heat and flames. Cable Protection Sleeves can be wrapped around existing cables with great ease. Personal protective clothing like Gloves, Hand Sleeves and Aprons made from Aramid (Kevlar®), Fiber glass, Aluminised Fiber glass, Silica and Ceramic fabrics. These products ensure protection from heat, metal splashes, cuts and occasional flames.